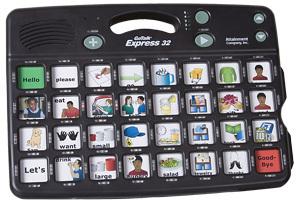 The Go Talk Express 32 is easy to use yet powerful. It adds some new features to previous GoTalks, like surround-message LEDs for visual prompts, an option to add a 1.5 second auditory cue to any message, and the ability to play multiple messages in sequence. Plus, the GoTalk Express is a fully functional scanning device, ideal for beginning or experienced communicators. These messages will play seamlessly in the order selected to simulate typical conversation. Users can easily edit their recorded expressions, plus save one long term. Both Standard and Express operations are available in scanning mode. GoTalk Express 32 is a full featured scanning device. Single switch access or step scan with 2 switches. Visual Cueingfour bright LED pipes surround the message keys. Auditory Cueingchoose between a 1.5 second recorded cue or beeps of varying tones. Scan Patternstep, linear, or group scanning available. Switch Accesssingle or double switch access with a switch debounce feature. Number of Messagesscan 2, 4, 8, 16, or 32 messages with a scan levels feature. Scanning Adjustments scan by row or column scan every other message choose fast, medium, or slow scanning speed make adjustments and see the effect immediately with the scan review feature.